One afternoon, when Bruno came home from school he was surprised to find Maria, the family maid - who always kept her head bowed and never looked up from the carpet - standing in his bedroom, pulling all his belongings out of the wardrobe and packing them in four large wooden crates, even the things he'd hidden at the back that belonged to him and were nobody's business. 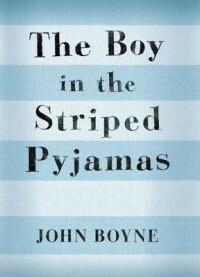 I read The Boy in the Striped Pyjamas by Irish author John Boyne in one long afternoon, as the first book in my WWII reading challenge. A children's book with very adult themes, this "fable" was translated into 34 languages and has recently been made into a film. The narration follows Bruno, a nine-year-old German boy, as he comes home from school one day and finds that all his belongings are being packed. In fact, his family (Mother, Father, Bruno, and his older sister Gretel) are moving away from Berlin to a distant place called Out-With, because Bruno's father has been given a new, important job there. Of course, Bruno is not happy with the change. In the new house there are no friends to play with, nor segret rooms to explore. But what is most astounding is the people he can see from the windows: men and children, all wearing some strange striped pyjamas. I won't go into more detailed a description of the plot here, because I don't want to spoil people more than they already are. When I approached the book, I knew it was going to be about the Shoah (I won't call it Holocaust because the word is very unappropriate): apart from the number of reviews I had already read, the cover gives it away, in my opinion. It might be that I know more about the Shoah than ordinary people (in high school I took part in a special project about it, which culminated in a visit to the concentration camp in Auschwitz), but this means that I could picture the setting very well. Reading The Boy in the Striped Pyjamas was a very strange experience. I've read many books about the same topic in the past, but I don't think I've ever come across anything similar before. I think it's very well written and engaging, and I'd definitely recommend it. 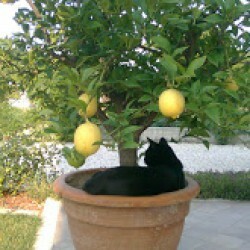 It's a bittersweet, heart-wrenching story because the reader knows more than Bruno, and can understand the situation while he cannot. In addition, the ending is like a punch in the gut. As much as I was expecting something like that to happen, it was very powerful. However, it's hard to suspend disbelief on some points. I find it difficult to believe than a German nine-year-old boy couldn't (wouldn't?) grasp Auschwitz's or the Fuhrer's name properly; and it's also hard to believe that Bruno and Shmuel's friendship could go on unnoticed for so any months. Moreover, Bruno has always led a very sheltered life; but I can't understand why Shmuel, too, won't explain to his friend how things really are in the concentration camp. All in all, a beautiful book. But definitely hard to digest.